The ZoneNinjaTM performs shallow tillage to freshen existing zones. The ZoneNinjaTM can apply liquid fertilizer while freshening. The ZoneFreshener™ row units are ideal for preparing the optimal seedbed. The ZoneNinjaTM performs shallow tillage to freshen existing zones. It can also apply liquid fertilizer while freshening. The new ZoneFreshenerTM row units on the ZoneNinjaTM can be shifted on the toolbar for sidedressing. The bubble coulter creates a trench for the liquid fertilizer to be placed, and the containment coulter ensures the nutrients are sealed in place. 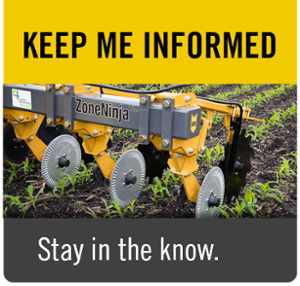 The ZoneNinjaTM can sidedress right next to the row or in between the rows. The all-new ZoneNinjaTM is a dual-purpose tool that can freshen zones one day and convert to side-dress the next - the ultimate combination in one piece of proven, field-tested equipment. It features the new ZoneFreshenerTM row units mounted on a new 3-point toolbar. Helps reduce planting time by putting pop-up fertilizer on while freshening fall zones. One tool that can freshen zones and sidedress. *Some images represent a field-tested prototype. Production model design may vary.